Bleach is commonly used for cleaning for a number of reasons, including disinfecting and removing stains. Many commercial cleansers use bleach in their formulas, but you don't have to spend a fortune on commercial products to clean with bleach. You can make a homemade bleach cleaner for a fraction of the cost, and it will work equally as well. Grab a jug of bleach and a spray bottle to get started. 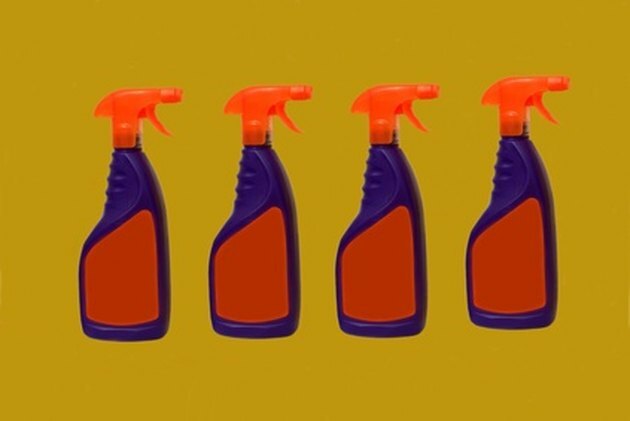 Put your homemade bleach cleaner in an old spray bottle. Measure 3/4 cup of bleach in 1 gallon of water. According to Clorox, this formula can be put in a spray bottle to clean showers, tubs, tiles, sinks, toilets, floors and even baby toys. You can also use this homemade bleach cleaning solution to soak and disinfect sponges and rags. Rinse whatever you are cleaning, wipe with a sponge moistened in the cleanser, rinse thoroughly and let it air dry. Mix 1 tbsp. of bleach with 1 gallon of water. According to Clorox, this mixture can be used to clean plastic cutting boards, dishes, work surfaces and even baby bottles. This mixture can also be used to clean other areas of your home such as refrigerators, freezers, countertops, stoves, stovetops, glass, trash cans, woodwork, walls and faucets. Rinse the item, wipe it with a sponge moistened in the cleanser, rinse well and let it air dry. Clean lawn furniture and garden tools with a homemade bleach cleaner. Reader's Digest recommends mix 1/2 cup of bleach with 1 gallon of water. Scrub the items with bleach cleaner, rinse well and let them air dry. Spraying a mixture of 1 cup of water and 1 cup of bleach on grout can get rid of mildew, according to Reader's Digest. If you spray it on mildewed grout, allow it to sit for 15 minutes, then scrub and rinse it to whiten the grout.